According to the Merriam-Webster dictionary, the definition of arthritis is “the inflammation of joints.” Arthritis can be caused by a wide variety of conditions including infection, trauma, and degenerative changes due to age or overuse, metabolic issues, or other causes. All cats regardless of age or breed can be affected by arthritis, though obese cats are more likely to develop it than are their fit counterparts. 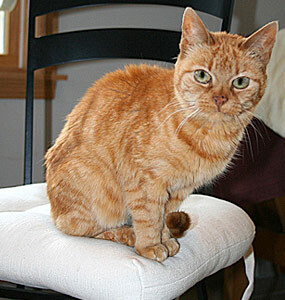 Additionally, older cats are more prone to arthritis because of the years of wear and tear on their joints. Arthritis can be mild to severe, and your pet may experience various signs depending on its severity. One way to evaluate your cat’s potential arthritis is to use a pain score chart, such as the one shown, below. This chart will allow you to evaluate your pet’s symptoms and identify the degree of severity. In order to treat your cat’s arthritis, your veterinarian will perform a thorough physical exam and take a complete history of your friend. They will perform simple motion tests and observe your cat’s movements. Once your cat has been diagnosed with arthritis, your veterinarian will recommend a treatment protocol tailored to your pet’s specific needs. If your cat is put on medication such as a nonsteroidal anti-inflammatory drug, your veterinarian may recommend routine lab tests of blood and urine to monitor your pet’s tolerance to the medication. Make sure you follow all recommendations from your veterinarian and call them immediately if your cat’s condition worsens. While not all forms of arthritis are preventable, you can help reduce your cat’s risk as well as the severity of the disease by ensuring your four-legged friend gets plenty of appropriate exercise, eats properly, and that you contact your veterinarian early if you think your pet may have arthritis.